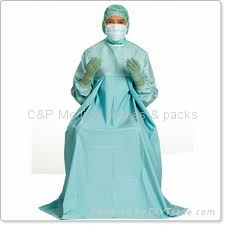 “C&P”gownshas designed with safety,comfortand flexibility.Werecognize that user may have different preferences for Surgical Gown.”C&P”offers4 styles,eachoffers different fabric that has its own unique qualites. “C&P” gowns are cut wider in the chest and sleeversfor a better fit.Allgowns feature a Velcro-Style neck closure that allows the neckline to easiltyadjust to variety people.Alsoit helps prevent gapping in the front of the gown to further help protect against fluids. C&P gowns are very low linting.min. the risk of introducing particles into the O.R.